The Student Veterans Association at Seattle Central is a club that supports veteran students and gives them a place to find resources and benefits with community support. It gives students a chance to meet and converse with other veterans at school. The club offers funding for school, stipends for books, disability support, living allowance, and referrals for counseling. The SVA also puts on events for veterans. Stand Down, was an event where community and college volunteers provided veterans with information, clothing, sleeping bags, dental checkups, haircuts and career planning. Another event is Drop Zone which is held every Friday in the Liberty Lounge, and promotes a positive atmosphere for military personnel transitioning to academic life. The Liberty Lounge is located in the North Plaza of campus and is a place for veterans to socialize, study, drink coffee and share insights about resources and the experience of returning to school. Veteran Benefit Coordinator Tony Diaz says “[Veterans] have a hard time adjusting to civilian life and dealing with society.” Diaz helps about 200 veterans receiving benefits at SCCC. “[The SVA] is not such a program…It’s more of a network for veterans to get services. It’s very chill,” says Angelo Giancana, a student veteran at Seattle Central. New veteran students usually get involved with SVA through Diaz who is a liaison between students, the school and the VA (Department of Veterans Affairs). Lori Miller and a student veteran started the SVA three years ago; she is the co-faculty advisor for the club and is also co-chair of the Veteran’s Task Force. The Task Force brings together students, administrators, staff and faculty to make SCCC a supportive and safe campus for veterans and “helps bridge between veterans and the school,” Miller says. Chanan Suarez is the Veterans Corps representative and acting president. He would like to see “greater visibility of student resources, a bulletin board for transitioning veterans with information”. 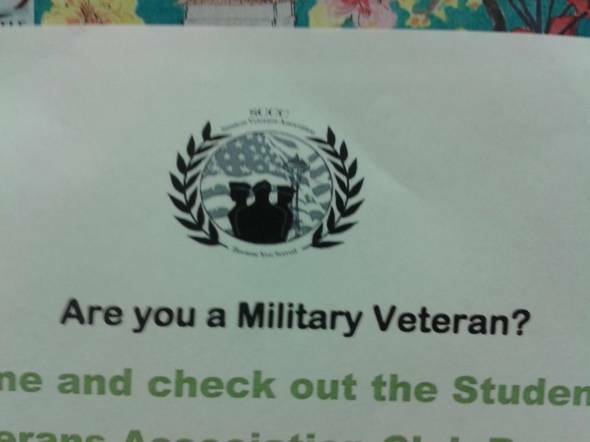 More flyers and signs around campus will also attract veterans who don’t know about the SVA and what they offer. Mike Grenakavich, a student vetern, suggests “[making] the club a bigger part of Seattle Central.” Returning military can receive a 50% reduction in tuition even without the GI Bill, which not all veterans know about. The Veterans Corps also refers students with transitional issues and counseling for PTSD. Grenakavich says his favorite thing about the SVA is “the camaraderie, and the brotherhood like in the military.” The bond built through the SVA helps veterans succeed in school and ensure a great future.